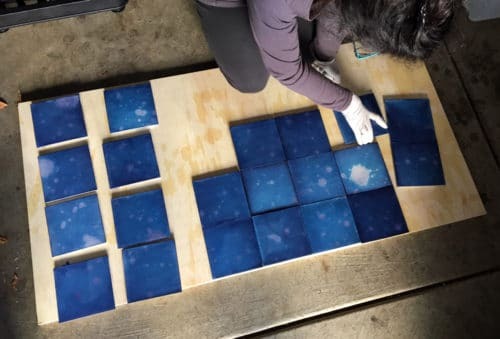 Ala Ebtekar, ceramic tile installation (in progress), 2018. Image courtesy of di Rosa. Ongoing to May 27- Living in Uncertain Times (Part I) at di Rosa Center for Contemporary Art: Unfolding in two parts throughout 2018, Be Not Still: Living in Uncertain Times addresses concerns of the present social and political climate through a radical new model of experimentation and inquiry. 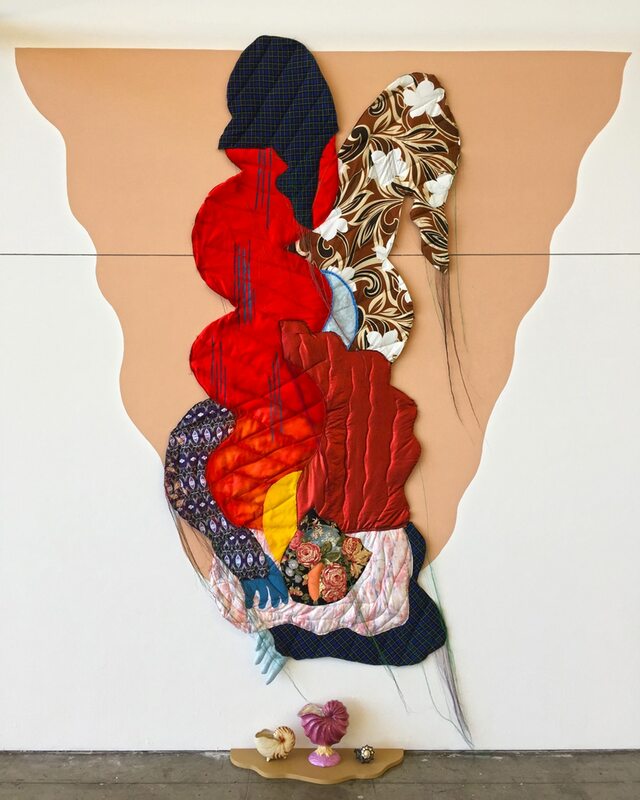 Assembling a diverse intergenerational mix of artists with ties to the Bay Area, the exhibition evokes a call to action, inviting participants to identify and respond to a theme of their choosing through the production of new work. Central to Be Not Still is an extensive education and civic engagement program including community partnerships and artist-centered programming, providing many opportunities for visitors to interact with the long-term, institution-wide exhibition throughout its run. di Rosa is located at 5200 Sonoma (Carneros) Highway in Napa. Related Event: In Conversation: Dodie Bellamy & Pamela Lee. Saturday, February 3rd, 2:30- 3:30pm. Jay Heikes, The Devil Has Left My Building, 2015. Image courtesy of the artist. February 14 to April 29– Jay Heikes/ MATRIX 269 at Berkeley Art Museum and Pacific Film Archive (BAMPFA): Many of the objects—paintings, sculptures, and drawings—presented in this exhibition were informed by time Jay Heikes spent at a residency in Marfa, Texas, in early 2017. The dry, crumbly terrain of the desert landscape and the site’s proximity to Mexico inspired his rumination and reflection on the significance of borders to our culture, a subject that has concurrently received much attention in the political sphere. The exhibition features two large-scale copper sculptures that loosely conjure fences. Yet instead of delimiting territory, the sculptures appear tenuous and ornamental, alluding to the fact that they define a metaphorical space rather than an actual one. The sculptures are complemented by a selection of paintings from Heikes’s Z series, which he developed as a way to signal the end of language, implied by his invocation of the last letter of the alphabet. 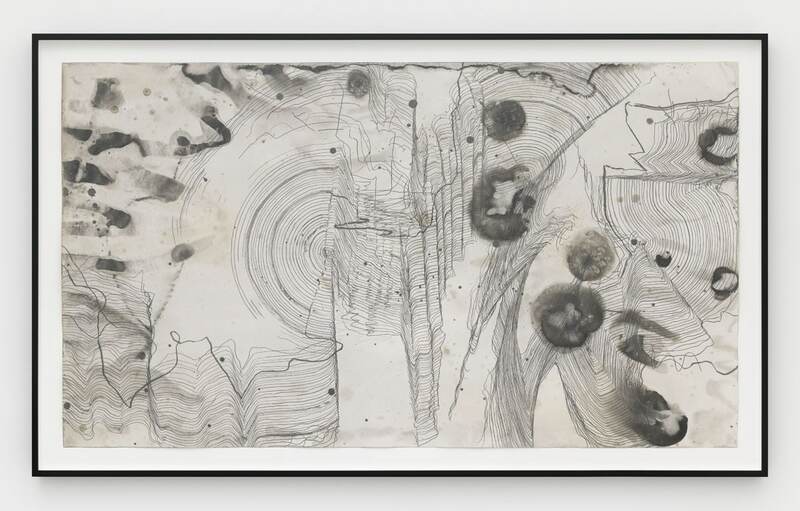 Additional drawings and sculptures extend his application of similar motifs. Together, the works embody the artist’s longing for transcendence amid the deluge of negative media in the wake of the presidential election. BAMPFA is located at 2155 Center Street in Berkeley. Artist Talk and Opening Reception: Wednesday, February 14, 6pm. 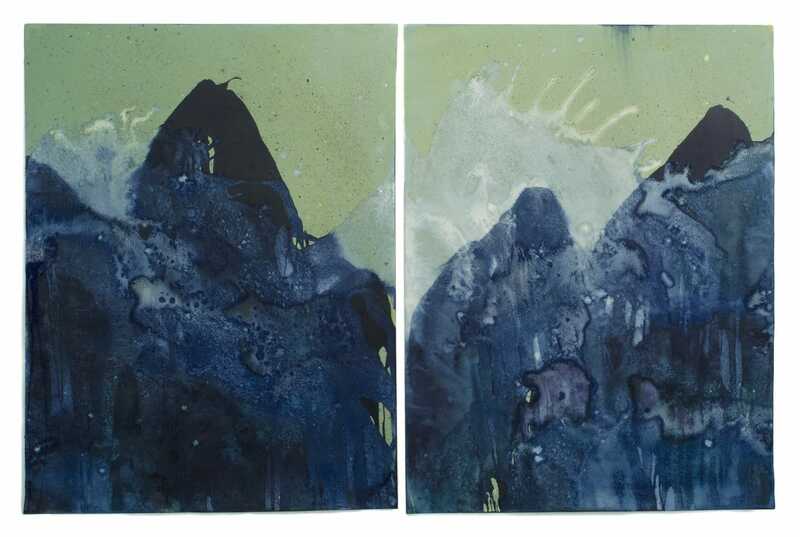 Meghann Riepenhoff, Littoral Drift Nearshore #765 (Diptych, Bainbridge Island, WA 09.05.17, Two Simulated Waves & Raining Ash from the Jolly Mountain and Eagle Creek Forest Fires). Image courtesy of Equinom Projects. February 15 to March 31- Meghann Riepenhoff: Imprint presented by Euqinom Projects: Meghann Riepenhoff relies on perspective, light and location to capture striking scenes of the natural world. What she doesn’t rely on is a camera. She uses the cyanotype process, a printing process in which paper or canvas treated with a photosensitive chemical solution is exposed to UV light (usually sunlight), resulting in blueprint- like pictures. Riepenhoff’s twist on the 19th-century technique allows earthy elements—sand, silt, coarse grains of salt, flecks of dirt—to leave their mark on her arresting pieces. The exhibit is located at 1599 Tennessee Street. Opening reception with the artist: Saturday, February 17, 5- 8pm. (Left) Philip-Lorca diCorcia, 1978, from his project A Storybook Life. (Right) Constance DeJong, Pink Knight Roland, 2015. Images courtesy of MFA. February 16th to May 5th- Stories and The Dilexi Series at McEvoy Foundation for the Arts (MFA): Stories features photographer Philip-Lorca diCorcia’s, A Storybook Life (1978-1999) and writer and performer Constance DeJong’s, Radios (2015-2017). Through images, audio, and objects, the artists’ fragmented narratives invite viewers to become an active part of storytelling. The Dilexi Series, originally broadcast over KQED in the Bay Area in 1969 and 1970, represents one of the first efforts to present works created by artists specifically for television. This series, of great historical and aesthetic value, has not been screened since the broadcasts of more than 12 years ago. MFA is located at 1150 25th Street, Building B. Opening Reception: Saturday, February 17th, 5- 8pm. Image from last years event. Image courtesy of Drew Altizer Photography. February 23rd to 25th- PHOTOFAIRS at Fort Mason Center in the Festival Pavilion: Experience fresh, cutting-edge, contemporary photography on a global scale. 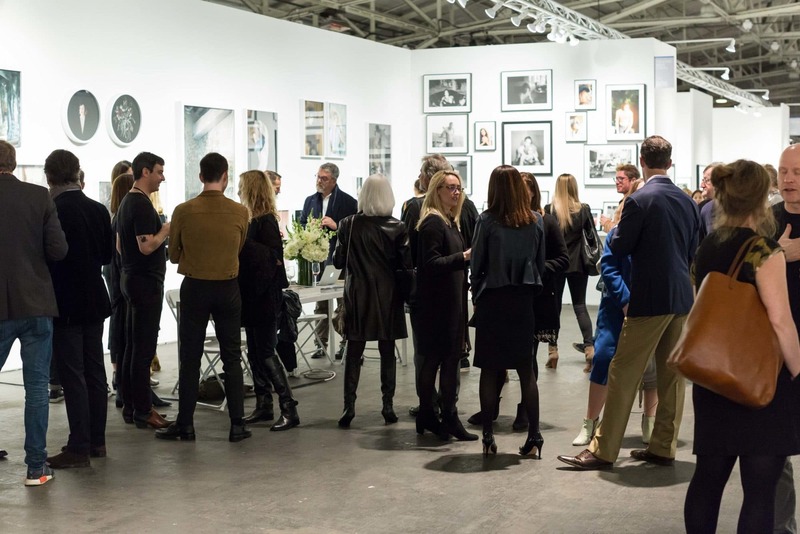 The boutique fair will collaborate with prominent galleries from around the world to create the West Coast’s leading destination for discovering and collecting artworks by emerging and internationally recognized artists. Fort Mason Center is located at 2 Marina Blvd. Opening night: Thursday, February 22nd. Benefit for the photography program at SF MoMA. Tickets on sale here. Maria Guzmán Capron, Meteorita, 2016. Image courtesy of the artist. February 23 to March 31– Spirited Probabilities at Southern Exposure: Spirited Probabilities invites and provokes the participating artists to engage directly with the physical structure of Southern Exposure. The artists examine the possibilities of the space and provide chance outcomes through playful interventions. Using Southern Exposure’s building as a prompt, they query what the space is able to contain. In some cases, the artists have created works for spaces not normally used for exhibition. The concept of the threshold—of overstepping or navigating edges and boundaries—is a recurring theme in the exhibition, as several of the artists navigate the realm between physical and imaged space. Others bring attention to areas of the space that are typically unseen: either beneath notice or deliberately ignored. Southern Exposure is located at 3030 20th Street. Opening Reception: Friday, February 23, 7- 9pm. Takahiro Yamamoto, Direct Path to Detour, 2017. Image courtesy of Mills College Art Museum. February 28th, 7pm- Artist Lecture Series: Takahiro Yamamoto at Mills College Art Museum: Organized each year in conjunction with the Studio Art MFA program and the Department of Art and Visual Culture, this lecture series allows students and faculty to invite contemporary artists to campus in order to gain greater perspective on current ideas and practices in the contemporary art world.Yamamoto works specifically in dance performance, sculpture, and photography. His practice is sociological and observational. It formally and metaphorically investigates intricacies in exposing performer’s idiosyncratic beings on stage such as physical qualities, emotional states, habitual behaviors, and expression of spontaneous thoughts. The lecture will be held in the Danforth Lecture Hall. Mills College Art Museum is located at 5000 MacArthur Blvd. in Oakland.